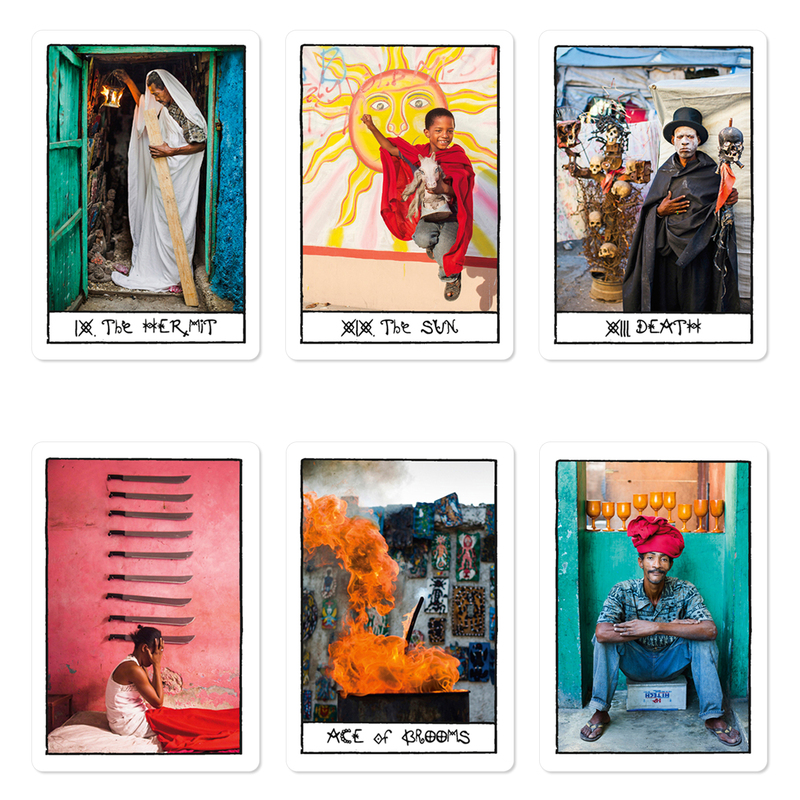 Ghetto Tarot by Alice Smeets – An extraordinary Tarot deck from Haiti! See the traditional tarot cards come to life in this creative, provocative, modern deck. 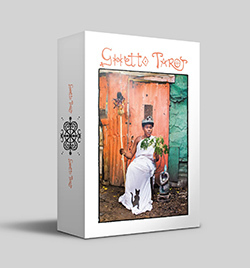 Inspired by the creativity and strength of the citizens of the ghetto, the Ghetto Tarot will guide you in changing your perception, turning negativity in your life into positivity while discovering the power of your own thoughts. 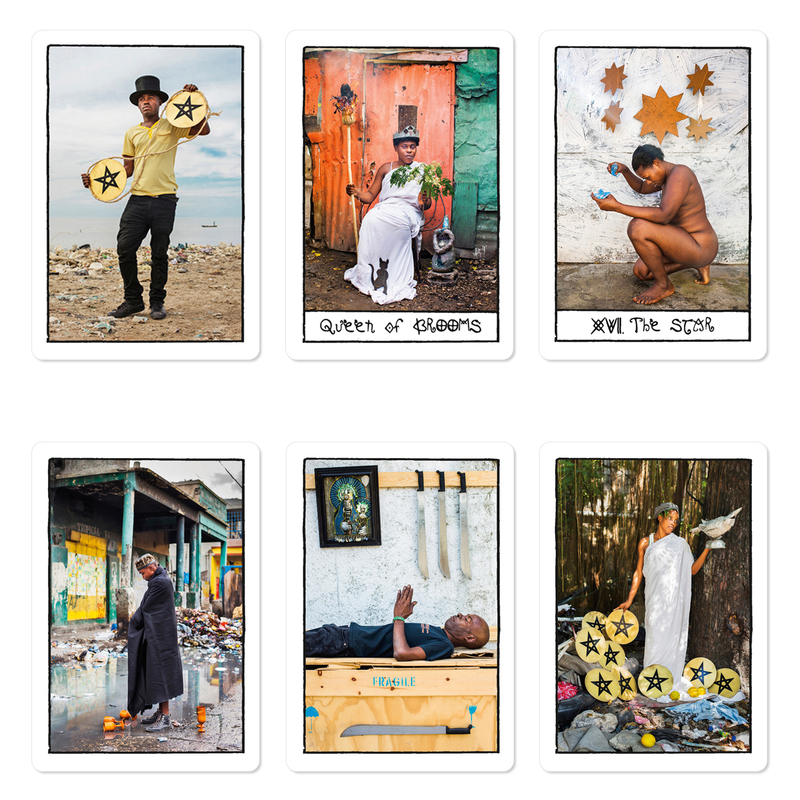 The Ghetto Tarot is a photographic interpretation of the well-known traditional Rider-Waite-Smith deck. Set in the Haitian ghetto, these fresh scenes were inspired by those originally created in 1909 by the artist Pamela Colman-Smith. The scenes were replicated by Alice Smeets with the assistance of a group of Haitian artists called Atis Rezistans using only material they were able to find or create locally. While Tarot originated many years ago when the circumstances within the world seemed very different, they still resonate today with timeless symbols that can be applied to our busy modern world. And not just our modern, Western world, but also to any other continent, country or culture, including the Haitian Ghetto. So here comes a contemporary, provocative and vivid tarot deck! The photo project aims to reach beyond cultural boundaries of prejudice and ignorance to achieve a much-needed transformation of the collective conscious perception of the ghetto whilst discovering the power of our own thoughts. Therefore the Haitian slum is presented in another light and the pictures highlight the creativity and strength of its citizens. The photographer is certain; Only we ourselves are able to assign value or judgment to a tangible or intangible thing, which creates a positive or negative emotion. We lend a word meaning according to the way in which we were raised, our personal experiences and depending on who taught us to speak. Every one of our sentiments is a choice based on our thinking. We can look at destruction and see either despair or the start of something new. With this awareness comes the power to change the meaning of every word, action and emotion. It’s all about perception. This means we are not slaves of our pasts, we are not imprisoned by our current societal pressures, but we are free if we choose to be. We can give ourselves the freedom to create our own reality! And if you want to find out how to change your perception… ask the cards! In Haiti, ‘ghetto’ means a life in the slums. It means living without financial security. Yet ‘ghetto’ also means community, family, solidarity, strength and rich creativity. The Haitians are claiming the word ‘ghetto’ for their own. The word reached the island from overseas where it was associated with racism, poverty and exclusion. They liberate themselves of this unfavourable interpretation and are turning it into something beautiful. Their act of appropriating a cheerless word by altering its meaning is an act of inspiration. Watch how they perceive their home! 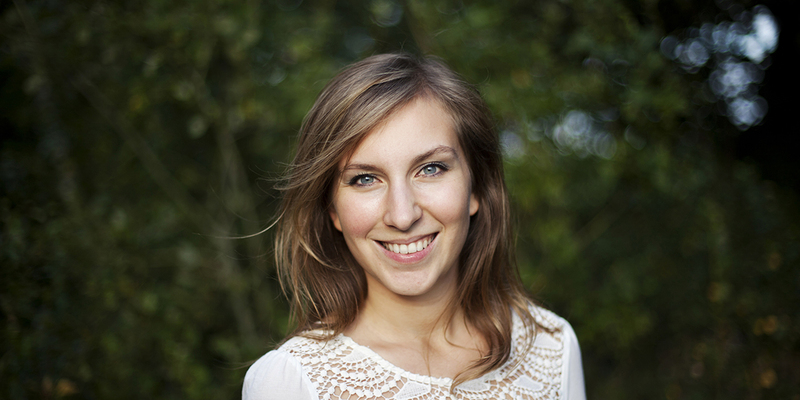 Alice Smeets is a Belgian photographer, filmmaker, artist and teacher. Her documentary photographs from Haiti are fairly well known and have won her several awards including the Unicef Photo of the Year Award 2008. For a long time, she wanted to interpret the Tarot Deck with her photos, but taking ordinary pictures of the scenes seemed too simple. Her aim was to create a very personal deck without loosing the different spirits of the cards. Then the idea entered her mind to combine three of her passions: the spiritual world, the Haitian culture and people as well as the philosophical reflections about the dualities in our world; in this case rich and poor. Since 2007 she has been a regular visitor to Haiti and has lived in the country for 2 years. Its complexity and spirituality have played a big role in her life. The observations of the Haitian society have brought answers to many of her questions. So taking the tarot pictures in the ghetto of Haiti’s capital Port-au-Prince was the obvious choice to create a very personal deck: moving away from the cliched images of poverty, illustrating the spirits and meanings of the cards with a touch of humor in the middle of the slum and showing colored people on the traditional, old European cards to break stereotypes. All the artists of the group ATIS REZISTANS grew up in downtown Port-au-Prince, in an atmosphere of junkyard make-do, survivalist recycling and artistic endeavour. Their powerful sculptural collages of engine manifolds, TV sets, wheel hubcaps and discarded lumber have transformed the detritus of a failing economy into bold, radical and warped sculptures. Alice had known the group of artists “Atiz Rezistans” for a long time and desired to work together with the group. They immediately jumped on board to create the Ghetto Tarot deck together. Being very spiritual themselves and working a lot with voodoo symbolism, they immediately understood the spirits of the cards. The photo scenes were created by Alice, putting the models into place. The artists allowed Alice to place their art pieces into the photos. Moreover, Atis Rezistans were very helpful to find the materials needed and often created them on the spot, like the lantern for the Hermit that is created out of a old metal can or the black cat for the Queen of Wands and the animals on the Moon that are made out of used car tires. One of the artists called Claudel Casseus was Alice’s personal assistant and did an amazing job. The Ghetto Tarot has toured the world. Here you can find all articles and interviews about the project, photographer as well as the Haitian artists.